CREATE UNFORGETTABLE MEMORIES ON YOUR PRIVATE BAJA CALIFORNIA CRAFT BEER + STREET TACOS TASTING TOUR FOR 2 TO 14 PARTICIPANTS! When it comes to craft beer tasting experiences, you really do get what you pay for… Our small and fun tasting tours max out at 14 tour participants per tour vehicle, so you know you’ll receive personalized service and attention from your BTK gastroguide. Living and working in the region, we’ve invested years into developing personal relationships with the owners of Mexico’s top craft breweries and taco stands, and since we only work with partners where the owners are part of the day-to-day operations of their businesses, you’ll experience their gracious hospitality and feel the sincere warmth of their personalities shine through to every aspect of your experience. Finally, we are storytellers, and we believe your tasting experience will be uniquely enriched when you know the stories behind this emergent craft beer movement… while other operators drop you off at the front door to let you fend for yourself, our bilingual gastroguides are with you every step of the day, translating where necessary, making recommendations as requested, and more importantly, sharing with you all of the interesting tidbits, secrets, and anecdotes that make for a rich and colorful experience. Read what past customers have to say about their experience with BTK. If you are staying in Tijuana or Rosarito, we can arrange to pick you up at your hotel or house rental. One pick-up location per group (multiple pick-ups for the same tour reservation may be available for an additional fee). Best man, Nate, planned a special Baja bachelor party for his best friend and groom to be, Scotty. 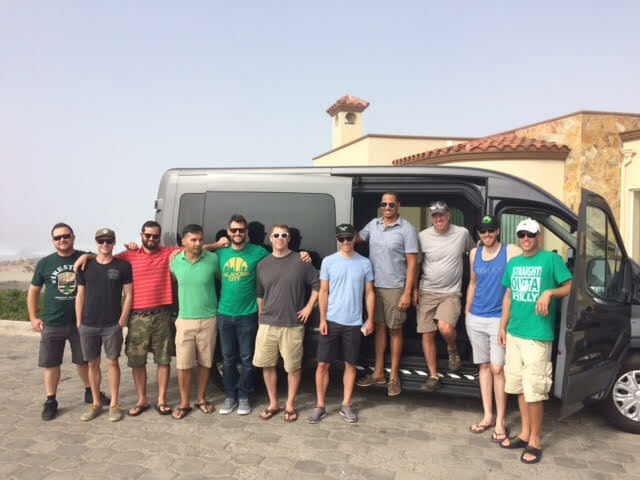 This is the “before picture,” leaving their house rental on the beach near Rosarito. The boys spent the day enjoying some awesome craft beers and street tacos… We probably shouldn’t share the after pictures!